Pace and timing are everything. With walkers littering the narrow path, I have to time every overtaking manoeuvre just right so as not to become a hazard, either to other walkers, or to myself. Moving steadily, my eyes fixed on the terrain, I gradually thread my way past more and more people, every one passed is another step closer to solitude. Some walkers are more tricky than others as they spread themselves across the path. The regular walkers are fine and I fall happily in behind them, our pace matching. It’s the inexperienced walkers that are tricky as they wobble and deviate across the path in anarchic movements. The surface below our feet is uneven and the stones are worn slippery with the feet of thousands. People are nervous. I too am nervous. No-one wants to fall. Descending the narrow, winding path, the gorge drops away from the other side of the fence and I find myself walking along the edge of an abyss, a magnificent abyss where sunlight falls on caches of snow tucked into granite creases in the cliffs opposite, and lights up myriad leaf patterns in the canopy below. The vegetation is so dense, it’s impossible to make out how far below me the bottom of the gorge lies. But there’s no time to stop and gawp. No time to take in the beauty around me. One delay and I’ll be right back where I was, stuck behind hordes of other walkers like a fast car in slow moving traffic. 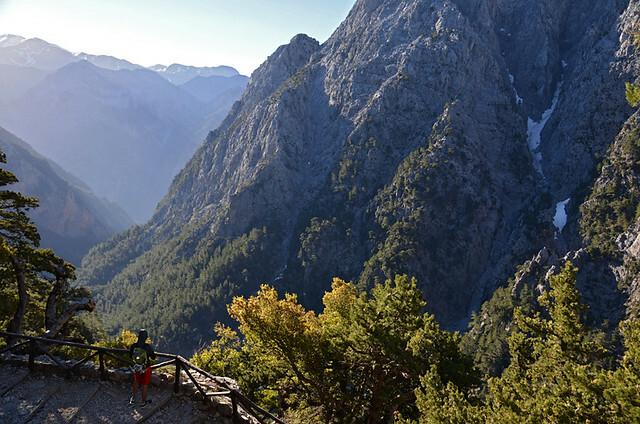 At 7:45am my taxi pulled up at the entrance to the Samaria Gorge, one of Crete’s most popular excursion destinations and a classic European gorge walk. Even as I paid the taxi driver, a coach pulled up alongside and hordes of people disembarked. I was surprised and irritated in equal measure. 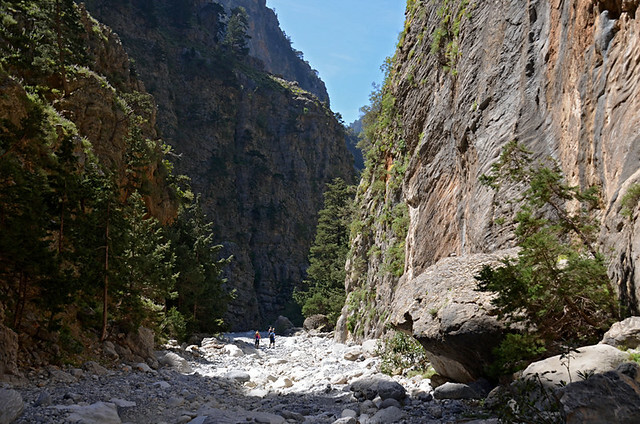 The taxi driver had assured me that a 7am start from Sougia would guarantee we arrived a good 15 minutes before the coaches, allowing me to enjoy the gorge without the crowds for which it is so well known. I hurried to the entrance and waited behind a French walking guide and her group who were showing tickets to a ranger. My mild irritation goes up a gear to annoyed. What was the point of paying for a taxi if I wasn’t going to avoid the masses? As I hurried back along the road to find the ticket office, three more coaches arrived and disgorged their passengers, all of whom already had tickets and headed straight to the gorge. By the time I got back to the entrance, there was a tide of walkers as far as my eye could see. It’s not until I reach the stream at the bottom of the gorge, almost an hour into the route, that the crowds thin and then pretty much disappear, swallowed up by the vastness of the landscape. Finally I can relax and begin to take in my surroundings. 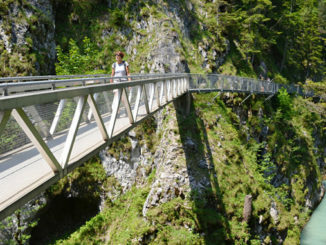 Tall, elegant cypress trees reach towards the top of the gorge walls which rise 500m above the valley floor. Around them, oaks, maples and Calabrian pines cluster, elbowing each other out of the way in their bid to get more light. Along the banks and beside the path, rock roses, anemones and cyclamen nod their heads in the gentle breeze. Despite the crowds, it feels like a secret place. In the confines of the gorge, everything is exaggerated; the birdsong is piercing and multi-layered, like a complex symphony; the vegetation is dense and chaotic; and the heat sits heavily, finding brief respite in the shade. Traversing a particularly splendid section of path lined by oleanders and shaded by plane trees, just outside the village of Samaria, something catches my eye in the dappled light of the woodland. I stand still and watch as a female kri-kri (Cretan wild goat) and her kid wander through the undergrowth, snatching mouthfuls of vegetation. I hardly dare breathe and as I take a step to get closer, the two become aware of my presence and in a few, short, graceful leaps, are gone. In Samaria village I rest beneath the trees and eat my ham and cheese croissant, hastily thrown together from the ingredients left in my room the night before in readiness for my pre-breakfast departure. The village is a strange place. 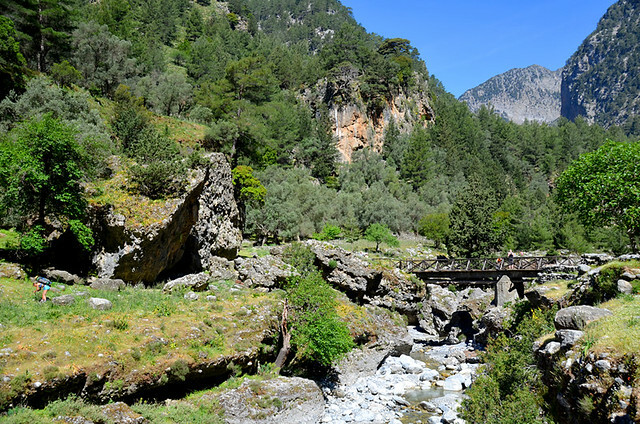 Once a refuge for Crete’s partisan rebels fighting against Turkish rule, and home to a small community of lumberjacks until 1962 when the National Park was created and they were forced to leave, a small handful of empty stone houses nestle amongst the plane trees beside the river. Wooden picnic tables are dotted around in the shade and there’s a water spring and some toilets. As I cross back over the bridge to continue my descent, I’m surprised to start passing walkers coming the other way. I’m suddenly unsure if I haven’t made a mistake and would have been better ascending the gorge instead of descending it. It would certainly be tougher, involving a climb of 1200m or so, most of it in the last 2km which would be something of a thigh killer at the end of a steady, 14km ascent, but it would have saved all that vying for space at the start. The next hour is spent walking along the stony riverbed and criss-crossing the stream on stepping stones. It’s not a place to dawdle. Signs spasmodically tell you not to loiter due to the real possibility of rock fall. The gorge is at its most dramatic here, the sheer sides rising and closing in as I progress until I reach what is known as ‘the gate’, the dramatic entrance to the gorge where the cliffs are at their narrowest. Beyond, the gorge opens out and I finally emerge and hand in my ticket stub. 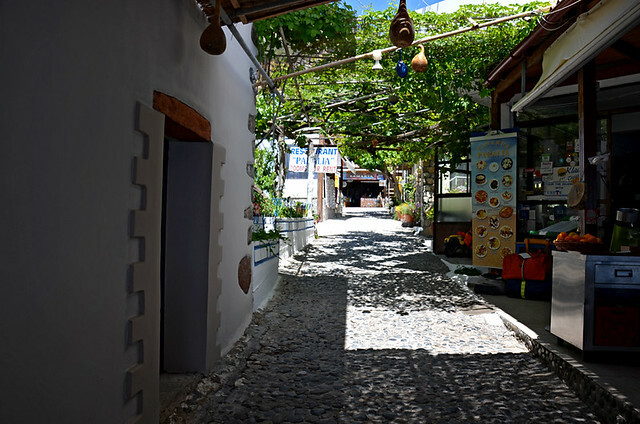 From there, it’s a flat walk to the ‘new’ village of Agia Roumeli, the original village having been destroyed by a flood in the 1950s. I buy a ticket to Sougia and head to the shaded terrace of a taverna for the long wait for the ferry. My only regret is that I missed the beauty of the beginning of the gorge as I was trying to create some breathing space for myself. With hindsight I wish I had just accepted that I was far from alone and still taken time to enjoy where I was. Eventually the crowds would thin, I was just impatient. is that everyone wants to walk it. After the site of the ancient city of Knossos, it’s Crete’s most popular day excursion, and visitors travel from across the island to descend it. Unless you’re prepared to get up in the middle of the night, or stay the night in Omalos, and get here for a dawn start, it’s difficult to avoid the crowds. 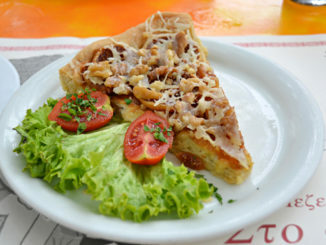 Alternatively, wait until after 11am to begin but you’ll need to be fairly certain of your ability to complete within 6 hours or you’ll miss the ferry from Agia Roumeli and will have to stay there for the night. The only other way to beat the hordes is to spend the night in Agia Roumeli, setting off early (around 8am) from the village, and ascending rather than descending the gorge. 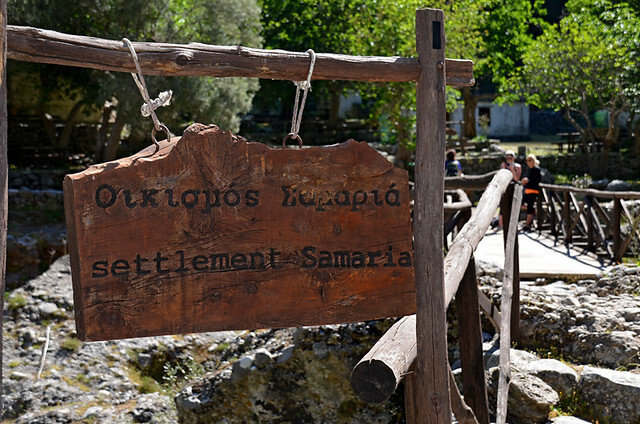 If you time your ascent right, you’ll get to the village of Samaria before the tide of walkers on their descent. You can then wait there (a long, leisurely brunch would be nice and there are plenty of places to pick up supplies in Agia Roumeli before you set off) until the mass of walkers has gone before continuing. You should have the second half of the route virtually to yourself. Beginning in the White Mountains and ending in the village of Agia Roumeli which is only accessible by sea, Samaria is a long way from anywhere on Crete. The easiest way to get there is to join an excursion. 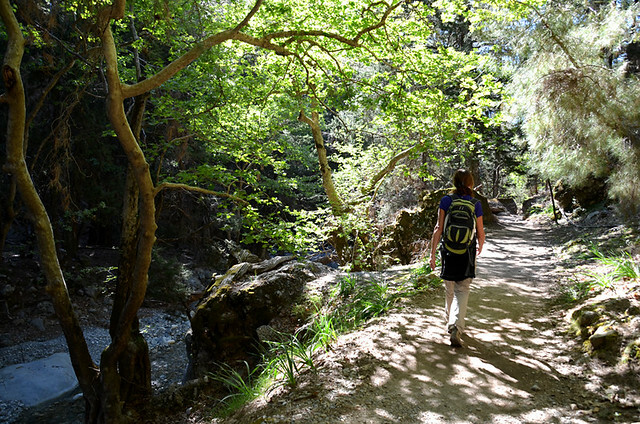 It’s the most cost-effective option and if you choose one that gets you to the gorge before 8am, you’ll still manage to avoid the bulk of other walkers. We were staying in Sougia from where a bus departs at 7am and reaches the entrance to the gorge at 8:10am, right in the midst of the multitudes of coach excursions. Getting a taxi from Sougia (€50 for 2 people, €60 for four and the taxi driver will find the other two passengers) takes just 45mins but you’ll need to leave Sougia around 6:30am to avoid the first coaches. Ferries depart Agia Roumeli at 17:30 for Sougia (€11) and for Chora Sfakion (€12.50) where coaches wait to take people back to their hotels or drop-off points.